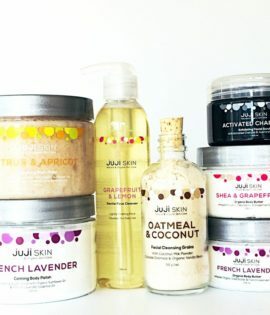 Juji Skin believes that skin care does not need to be complicated and has developed their products using only all-natural, organic and food grade ingredients. By omitting water from the formulas, we are able to claim that Juji Skin has formulated one of the cleanest lines available on the market as no preservatives, parabens, animal products, fillers, petrochemicals, or toxic ingredients are needed or added. It is as effective as it is clean, as all ingredients are included for specific reasons resulting in botanical ‘skin bombs’ that provide amazing results for normal, dry, maturing, or sensitive skin. Juji Skin is also incredibly passionate about the planet and everything that lives on it. For that reason, the entire line is vegan, never tested on animals, and only uses sustainable, renewable, and environmentally responsible ingredients and packaging for all of it’s products.